Our forecast includes hot temperatures over the next few days, with temps in the middle 90s. As Hurricane Earl stays away from central Alabama, we’ll deal with sinking air, which means dry weather can be expected on Wednesday and Thursday. A cold front moves in here on Friday night and cooler weather moves in on Sa…turday and Sunday. Highs in the upper 80s. Our forecast includes hot temperatures over the next few days, with temps in the middle 90s. As Hurricane Earl stays away from central Alabama, we’ll deal with sinking air, which means dry weather can be expected on Wednesday and Thursday. A cold front moves in here on Friday night and cooler weather moves in on Saturday and Sunday. Highs in the upper 80s. ALTHOUGH THE SATELLITE PRESENTATION IS NOT AS IMPRESSIVE AS IT WAS EARLIER…A RECONNAISSANCE PLANE AROUND 1700 UTC REPORTED A MINIMUM PRESSURE OF 940 MB AND MAXIMUM FLIGHT-LEVEL WINDS OF 128 KNOTS. THESE DATA SUPPORT AN INITIAL INTENSITY OF 115 KNOTS. CURRENTLY…THERE IS SOME SOUTHWESTERLY SHEAR DISRUPTING THE UPPER-LEVEL OUTFLOW OVER THE WESTERN SEMICIRCLE OF EARL. 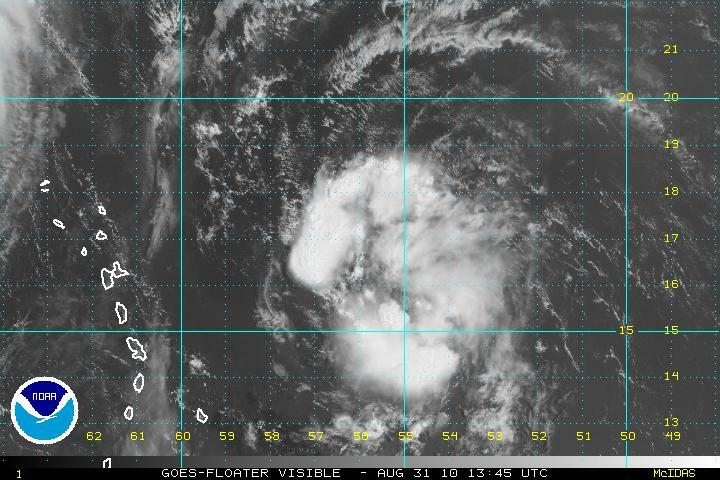 THIS SHEAR IS CAUSED BY A WEAK UPPER-LOW OR TROUGH OVER THE EASTERN BAHAMAS AS OBSERVED ON WATER VAPOR IMAGES. HOWEVER…MODELS WEAKEN THE UPPER LOW AS EARL MOVES AROUND IT…RESULTING IN A MORE FAVORABLE ENVIRONMENT. EARL IS EXPECTED TO MAINTAIN ITS CATEGORY FOUR INTENSITY FOR THE NEXT DAY OR TWO. EARL HAS BEGUN TO MOVE TOWARD THE NORTHWEST OR 305 DEGREES AT 12 OR 13 KNOTS DURING THE PAST FEW HOURS. THE SUBTROPICAL HIGH THAT IS STEERING EARL TOWARD THE WEST-NORTHWEST OR NORTHWEST IS FORECAST TO GRADUALLY SHIFT EASTWARD AS A BROAD TROUGH BECOMES ESTABLISHED OVER THE EASTERN UNITED STATES. THIS PATTERN WILL FORCE EARL ON A MORE NORTHWESTERLY AND NORTHERLY TRACK FOR THE NEXT DAY OR TWO. THEREAFTER…EARL WILL REACH THE BASE OF THE MID-LATITUDE WESTERLIES AND WILL LIKELY TURN SHARPLY TO THE NORTHEAST WITH AN INCREASE IN FORWARD SPEED. THIS IS THE SOLUTION UNANIMOUSLY PROVIDED BY TRACK GUIDANCE. ONCE AGAIN THE OFFICIAL FORECAST HAS BEEN SHIFTED A FEW MILES TO THE WEST BEFORE 48 HOURS FOLLOWING THE TRENDS OF THE ECMWF AND THE GFS. GIVEN THE LARGE AREA OF TROPICAL STORM FORCE WINDS ASSOCIATED WITH EARL…AND THE NEW DEFINITION OF WATCHES AND WARNINGS…A HURRICANE AND TROPICAL STORM WATCH HAS BEEN ISSUED FOR A PORTION OF THE MID- ATLANTIC COAST. THE EYE HAS BECOME OBSCURED ON VISIBLE IMAGES AND THIS IS REFLECTED IN A DECREASE IN THE DVORAK NUMBERS AND IN AN INCREASE IN THE PRESSURE TO 939 MB. THIS APPARENT WEAKENING IS MOST LIKELY RELATED TO AN ONGOING EYEWALL REPLACEMENT CYCLE AS INDICATED BY THE DOUBLE EYE STRUCTURE OBSERVED ON MICROWAVE DATA AT 1035 UTC. HOWEVER…AN AVERAGE OF THE FLIGHT-LEVEL WINDS AND SFMR DATA FROM THE AIR FORCE RECONNAISSANCE PLANE STILL SUPPORTS AN INITIAL INTENSITY OF 115 KNOTS. NO CHANGE IN INTENSITY IS EXPECTED TODAY BUT THERE IS A CHANCE FOR EARL TO STRENGTHEN A LITTLE DURING THE NEXT 24 HOURS IF THE OUTER EYEWALL SHRINKS. DESPITE THE FLUCTUATIONS IN INTENSITY… EARL MOST LIKELY WILL RETAIN CATEGORY FOUR STATUS FOR THE NEXT 48 HOURS. A GRADUAL WEAKENING SHOULD BEGIN THEREAFTER AS THE SHEAR INCREASES. NORTHEAST BETWEEN THE RIDGE AND MID-LEVEL TROUGH OVER THE EASTERN UNITED STATES. THIS IS THE SCENARIO PROVIDED BY MOST OF THE DYNAMICAL MODELS. THE OFFICIAL FORECAST HAS SHIFTED A LITTLE TO THE WEST BEFORE 48 HOURS AND IS ON THE WESTERN EDGE OF THE GUIDANCE ENVELOPE. GIVEN THE TRACK AND THE LARGE AREA OF TROPICAL STORM FORCE WINDS…A HURRICANE WATCH WILL LIKELY BE REQUIRED FOR A PORTION OF THE MID-ATLANTIC COAST LATER TODAY. INTERESTS FROM THE CAROLINAS NORTHWARD TO NEW ENGLAND SHOULD MONITOR THE PROGRESS OF EARL. THERE IS STILL CONSIDERABLE UNCERTAINTY AS TO HOW CLOSE THE HURRICANE WILL COME TO THE U.S. EAST COAST. AN AIR FORCE RESERVE HURRICANE HUNTER AIRCRAFT EARLIER REPORTED 700 MB FLIGHT-LEVEL WINDS OF 124 KT…AND ESTIMATED SURFACE WINDS OF 112 KT FROM THE SFMR. THE PLANE ALSO REPORTED A CENTRAL PRESSURE OF 931 MB. BASED ON THIS…THE INITIAL INTENSITY IS SET AT 115 KT. SINCE THE PLANE LEFT…A TRMM OVERPASS AND DATA FROM THE SAN JUAN WSR-88D RADAR INDICATE THAT EARL HAS STARTED AN EYEWALL REPLACEMENT CYCLE. ANOTHER HURRICANE HUNTER AIRCRAFT WILL ARRIVE IN EARL NEAR 12Z TO DETERMINE IF IT HAS PEAKED IN INTENSITY FOR NOW. THE INITIAL MOTION IS A WOBBLY 295/11. THERE IS LITTLE CHANGE TO THE TRACK FORECAST PHILOSOPHY FROM THE PREVIOUS ADVISORY. EARL SHOULD MOVE GENERALLY NORTHWESTWARD FOR THE NEXT 48 HR OR SO ON THE SOUTHWESTERN SIDE OF THE SUBTROPICAL RIDGE. AFTER THAT…THE HURRICANE SHOULD TURN NORTHWARD AROUND THE WESTERN END OF THE RIDGE…FOLLOWED BY A TURN TO THE NORTH-NORTHEAST AND ACCELERATION ON THE EAST SIDE OF A STRONG DEEP-LAYER TROUGH MOVING INTO THE NORTHEASTERN UNITED STATES. THE TRACK GUIDANCE IS TIGHTLY CLUSTERED FOR THE FIRST 72 HR…WITH SOME SPREAD IN THE TRACK DIRECTIONS BETWEEN THE LEFT-MOST HWRF AND THE RIGHT-MOST GFS ENSEMBLE MEAN THEREAFTER. THE NEW FORECAST TRACK IS AN UPDATE OF THE PREVIOUS TRACK AND LIES JUST LEFT OF THE CENTER OF THE GUIDANCE ENVELOPE. THE INTENSITY FORECAST IS A LITTLE PROBLEMATIC. THE GFDL AND GFDN MODELS SUGGEST THAT EARL COULD STRENGTHEN DURING THE NEXT 24 HR OR SO…AND THIS COULD OCCUR IF THE HURRICANE COMPLETES THE EYEWALL REPLACEMENT QUICKLY ENOUGH. ON THE OTHER HAND…EARL IS FORECAST TO BE IN AN ENVIRONMENT OF MODERATE SOUTHWESTERLY VERTICAL WIND SHEAR…AND WATER VAPOR IMAGERY SHOWS VERY DRY MID/UPPER-LEVEL AIR APPROACHING THE HURRICANE FROM THE NORTH. THESE FACTORS COULD PREVENT ADDITIONAL STRENGTHENING. THE INTENSITY FORECAST WILL FOLLOW THE GFDL/GFDN SCENARIO WITH A LITTLE MORE STRENGTHENING DURING THE NEXT 12-24 HR…BASED ON THE HURRICANE COMPLETING THE EYEWALL REPLACEMENT AND THE DRY AIR NOT REACHING THE HURRICANE CORE. THE FORECAST TRACK TAKES EARL OVER COLDER SEA SURFACE TEMPERATURES AND INTO INCREASING SHEAR AFTER 72 HR…WHICH SHOULD CAUSE STEADY WEAKENING AND EVENTUAL EXTRATROPICAL TRANSITION. INTERESTS FROM THE CAROLINAS NORTHWARD TO NEW ENGLAND SHOULD MONITOR THE PROGRESS OF EARL. 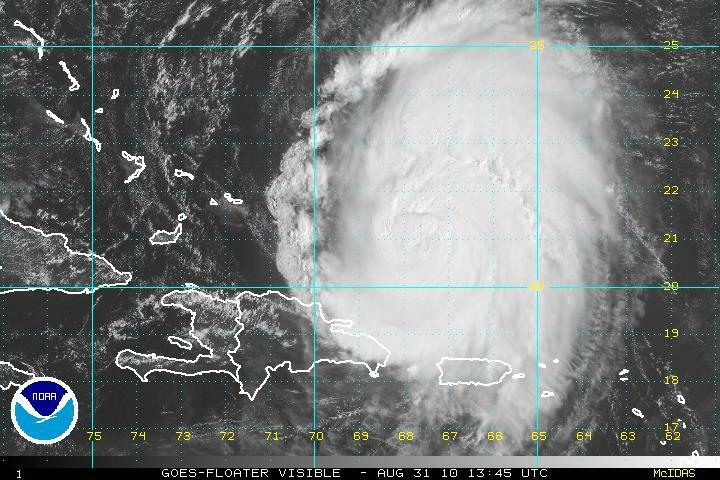 THERE IS STILL CONSIDERABLE UNCERTAINTY AS TO HOW CLOSE THE HURRICANE WILL COME TO THE U.S. EAST COAST. INTENSITY IS HELD AT 35 KT…IN AGREEMENT WITH AN 0056 UTC ASCAT PASS AND A 1007 MB PRESSURE REPORT FROM BUOY 41040. ONLY A LITTLE STRENGTHENING IS FORECAST IN THE SHORT TERM DUE TO MARGINALLY FAVORABLE UPPER-LEVEL WINDS…SOME DRY AIR AROUND THE CYCLONE…AND CURRENT LACK OF ORGANIZATION. THE SHIPS MODEL SHOWS NORTHEASTERLY SHEAR INCREASING SIGNIFICANTLY IN 24-36 HOURS…AND IF CORRECT…THAT SHOULD LIMIT ADDITIONAL STRENGTHENING. THIS INTENSITY FORECAST IS UNCHANGED FROM EARLIER AND REMAINS NEAR THE LOW END OF THE MODEL GUIDANCE. THE AFOREMENTIONED ASCAT PASS AND A TRMM OVERPASS AT 0303 UTC SUGGESTED THAT THE LOW-LEVEL CENTER…ALBEIT NOT VERY EASY TO LOCATE…WAS SITUATED A LITTLE TO THE NORTH OF THE PREVIOUS ESTIMATES. THEREFORE…THE INITIAL MOTION ESTIMATE IS AN UNCERTAIN 285/20. A NARROW MID-LEVEL RIDGE LOCATED ALONG 25 N OVER THE CENTRAL AND EASTERN ATLANTIC IS EXPECTED TO KEEP FIONA ON A RATHER FAST WEST-NORTHWESTWARD COURSE FOR THE NEXT DAY OR SO. THEREAFTER…THE CYCLONE IS EXPECTED TO APPROACH A WEAKNESS IN THE RIDGE…WHICH WILL BE ENHANCED BY HURRICANE EARL…AND THAT SHOULD CAUSE FIONA TO GRADUALLY SLOW DOWN AND TURN TO THE NORTHWEST. THE ECMWF…WHICH HAS BEEN THE LEFT-MOST MODEL FOR THE PAST COUPLE OF CYCLES…IS NOW ON THE RIGHT SIDE OF THE GUIDANCE ENVELOPE. IN GENERAL…THE MODEL GUIDANCE HAS SHIFTED SLIGHTLY TO THE RIGHT AND IS A LITTLE FASTER AT THE END OF THE PERIOD…AND THE NHC FORECAST HAS BEEN ADJUSTED IN THAT DIRECTION.